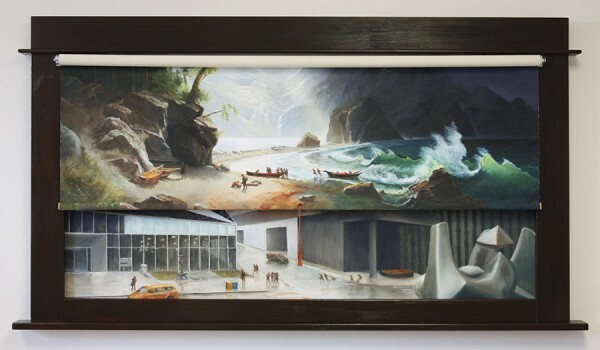 Puget Sound on the Pacific Coast, oil on canvas with mixed media, 33 in x 61 in. Detail, Puget Sound on the Pacific Coast. This work has been in process for a long time, and I am thrilled to finish it and see it assembled. 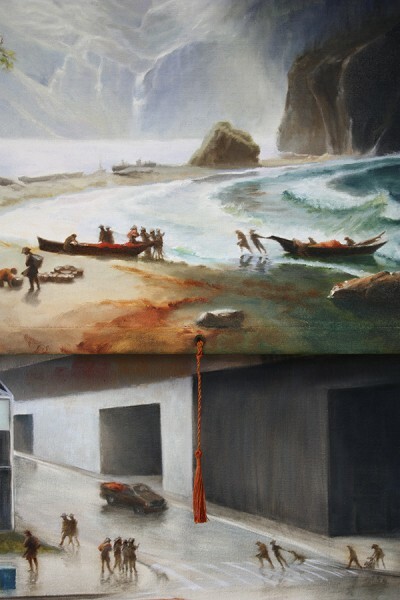 It juxtaposes Albert Bierstadt’s wildly imaginary painting of the same name with a contemporary Seattle location. Using, yes, a roller blind. I have been distracted by the implications of the pairing for months. Manifest Destiny meets the future. Crashing waves meet gentle drizzle. Romanticism meets post-modernism. Dramatic cliffs (the mountain looming higher than Everest through the cloud tops doesn’t show in this view) meet the glacial hills of downtown Seattle – some of which were actually sluiced into the bay during a 1902-1911 regrade project. The light hasn’t changed, though; Bierstadt may never have visited the future site of Seattle, but his Alaska travels clearly familiarized him with the soft dove-grey light of the Pacific Northwest. And the man could paint. This entry was posted on Friday, September 28th, 2012 at 6:52 pm	and is filed under art. You can follow any responses to this entry through the RSS 2.0 feed. Both comments and pings are currently closed.